"The White Masai" is a movie originally produced in German, about a Swiss woman who falls in love with a Masai warrior in Kenya. They marry and find that the conflict from cultural differences may be too much to bear. The movie is actually autobiographical, and based on the non-fiction book of the same name, written by Corinne Hoffman. The story revolves around a white woman, Carola and a Kenyan man, Lemalian. The Story of "The White Masai"
Carola comes from Switzerland to visit Kenya and sees what she thinks is a Masai warrior (he is actually from the Samburu tribe). She is completely taken with the exotic man, and then decides to give up her life in Switzerland in order to come back to Kenya and find him. Though their relationship is pretty much one-sided (her side) they do eventually marry and Carola must try to adapt to the ways of bush. Though the other women in the village try to accept her, Carola herself never really accepts the massive change that she has experienced. She continues to try and live a Western style life, which never works out and causes both her and her Kenyan husband a great deal of stress. The differences between male and female roles, the unfamiliar diet, language barriers and conflicts with local officials all add up to a disastrous life for Carola. It's hard to imagine that she could have expected anything else. She stays for 3 years, and has a child. Eventually her life becomes unbearable and she leaves Kenya with her daughter, to return to Switzerland. She does eventually return many years later, a story which has been published in a sequel book, titled "Reunion in Barsaloi." This part of her story has not yet been made into a movie. The movie got somewhat mixed reviews from viewers, namely because the character of Carola is difficult to watch. She makes so many foolish decisions and doesn't seem able to really grasp her position, even after years of living in Africa. Though the movie was beautifully shot, with stunning scenery and locations, the story itself sometimes failed to capture your imagination. This isn't a romantic tale by any means, but a story of struggle and the inability of one woman to adapt to her surroundings. 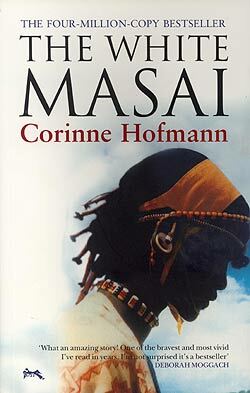 "The White Masai" was produced in 2005, under the German title "Die Weisse Massai". The movie was directed by Hermine Hunterbeburth, and starred Nina Hoss as Carola and Jacky Ido as her husband, Lemalian. The book was written into a screenplay by Johannes Betz. For her role in "The White Masai", Nina Hoss won a Bavarian Film Award for Best Actress.